This stream of religious soap-related babble is an excerpt from the label of a bottle of Dr. Bronner's Peppermint Castile Soap. The whole label is covered with this stuff. If I were religious, I would worship this soap. Buy it; believe in it; don't ever brush your teeth with it. 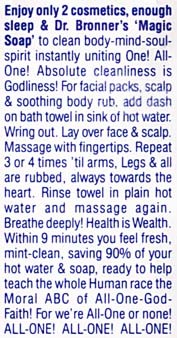 GET Dr. Bronner's Soap stuff HERE! In the U.S., the grocery chain "Wild Oats" carries it. Some mom-and-pop drugstores have it as well. Here in New Hampshire, the Hanover Co-op stocks some flavors. You can also order it online at www.drugstore.com (do a search for "castile soap" and it comes up) and several other online companies sell it, too. This is a great improvement to an already very good product. The soap is milder and less drying. Also a 10 percent price increase due to the new formula. Even the wrapper blurb is a little different. The old guy died in 1997." "Diane" (dianora at worldnet.att.net) writes: "Whole Foods chains also carry the soaps." "Shannon & Bill Bodenstein" (bbodenstein at cinci.rr.com) writes: "FYI -- Dr. Bronner's soaps are available on the Internet at healthshop.com at good prices." "Maxine McConnell" (mmmcconnell at pdm.com) writes: "The soap is available at MotherNature.com. You can even buy it in 32 ounce bottles!" Well, William, according to the friend who first turned me on to Dr. Bronner's, using the soap as toothpaste results in an uncontrollable bout of gagging, which is something I try to avoid at all costs. "Lolli" (lolli399 at yahoo.com) writes: "I know this is going to sound bizarre, but I grew up with the grandson of Dr. Bronner and we always used the soaps. It was great running across supporters of it. If you are still looking for a list of places that sell it, let me know." "Vic" in Sacramento, CA (supresmooth at hotmail.com) writes: "All of the piercing parlors here sell the plain. I know Sub Q has a whole bunch of different scents. :D "
"Gary" (gary at tubenet.com) writes: "I've been brushing my teeth for the last year with dr. bronner's peppermint. It works great! No gagging. The secret is to use just enough of the soap. Don't use a lot, just a 'tad' - it helps to water it down 50% first (in the container). That's what I do for bathing too. Happy cleaning!" "Judith" (judithel at pacbell.net) writes: "Hi, i'm writing you because you seem to want to affect things. Bottling substances for human use in plastics is a very large risk. Please refer to SIERRA magazine, issue Nov.-Dec. 2003 pags 16-18 for the run down: "Single use" plastic bottles made of polyethylene terephthalate [#1 PET or PETE] are ...found that they may break down and release suspected carcinogen DEHA." Dr. Bronner discontinued the healthful practice of bottling in glass several years ago. It was then that I discontinued using his product Balanced-Mineral-Bouillon, a mineral source on which I had depended. It is only now that there is available evidence to back up my intuited behavior. I wish to share this info with all. Please spread the word about plastics. A good website to see is www.thegreenguide.com It can provide all kinds of great info. Sincerely, Judith"
Thanks, folks! Sorry to take so long to post your emails.